Another weirdly themed Vocaloid release. 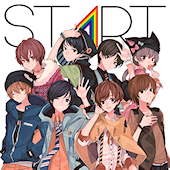 Apparently title refers to the utaite who will be featured, in that they’re all recent discoveries or had their debut albums released recently. Utaite include Ikasan, rairu, Sou, Rio, and others. Bonus items include a can badge (1 of 8 designs). Visit the official site for more info.